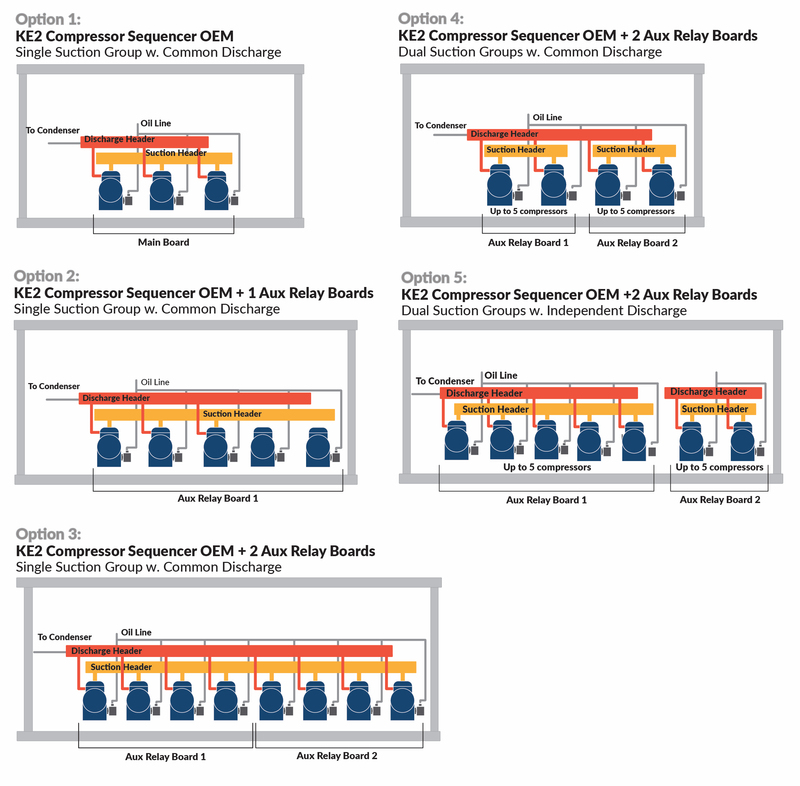 The KE2 Compressor Sequencer OEM allows control of up to 8 stages of loading for a single suction group, or up to 10 stages of loading (5 per suction group) for dual suction groups. For dual suction groups, the controller is applicable to both racks with a shared common discharge, or independent discharge lines. Suction pressure can be controlled to either a fixed setpoint, or a floating suction pressure for maximum efficiency. Each stage of loading can be set to: fixed speed compressor, variable speed compressor, digital compressor or unloaders. The relays for the stages can alternatively be used to control a Master Liquid Line Solenoid, or as a Hot Gas Defrost Relay. As is standard with many other KE2 Therm controllers, the KE2 Compressor Sequencer OEM has the simplest and easiest communication platform in the industry. The controller uses standard communication protocols and cables; no extra software is necessary, only an Ethernet connection to the controller. E-mail and/or text alerts can be sent out right from the controller. Complete remote access is available during startup with one simple button press and an Internet connection.